Our team of highly qualified superintendants, marine engineers, naval architects and certified marine surveyors have been credited to date with a number of high profile surveys, technical consultancies, project management assignments, over 35 dry-dockings, several major & minor conversions from single-hull to double-hull tankers, conversions from tankers to oil recovery vessels, numerous cargo lines & segregated ballast systems modifications, procurement & supplies of ships' parts and environmental protection services. Oceanus Marine are appointed as unrestricted marine surveyors on behalf of the Maltese Government (unrestricted), MCA (restricted), flag inspectors for Commonwealth of Dominica and INSB exclusive surveyors for Malta. They are also certified as MLC 2006 Train the Trainers and Surveyors on behalf of Transport Malta. Oceanus Marine is also an active member of SCMS, FEMAS, IMarEST, IET & MNA. Surveys carried out on vessel and yachts both commercial and pleasure on behalf of the Government of Malta. Such surveys are undertaken to determine tonnage measurements, survey reports, statutory certificates for vessels and yachts both pleasure and commercial. Surveys and inspections carried out on commercial yachts on behalf of the Government of Malta. Documentation required by the vessel/yacht owners in respect to the MLC 2006 and ISM are catered for. These policies and forms are custom created for each and every company. To strengthen the capacity of trainers to train maritime labour inspectors in the MLC 2006. Better quality and consistency in worldwide inspection systems is the aim of this course. To strengthen the knowledge of maritime labour inspectors in the MLC 2006. Better quality and consistency is thus ensured on a worldwide scale. Surveys for vessels, pleasure & commercial yachts under 24m. The International Naval Survey Bureau ensures applicable safety standards are met and maintained within the Mediterranean, European and North African region. Vessel registration under Dominica is efficient, straightforward and cost effective. This registry offers owners a cost effective registration with no tonnage tax or size restrictions. The C&E report provides a detailed and clear picture of the pleasure yacht's equipment, structural integrity and machinery and also a market value based on the current market trends. Surveys conducted on behalf of P&I clubs, insurance underwriters and claims departments. A comprehensive survey intended to cover vessel's & yacht's hull, cargo tanks / holds, machinery & equipment, void spaces and accommodation quarters. Ships & Yachts - Overall condition of the Hull, Deck, Machinery, Electrical installation, Navigational equipment are thoroughly inspected. Mainly undertaken for investigation, identification & quantification of damages. Casualty investigations are also undertaken on behalf of insurance underwriters. Used to identify hidden structural failures on GRP, wood, steel & aluminum hulls, delamination and osmosis in fiberglass, previous repairs. Electrical installations & engine diagnosis. These surveys are requested by charterers prior to or upon completion of a charter party. Structural damages, general condition of tanks / holds and bunker fuels quantification are inspected. Steel & pipework, Mechanical, Electrical & Electronic, Refrigeration & Air-condition, Hydraulic, Fuel injection & turbo, Fiberglass, Stainless steel works, Manufacture & Fabrication machine shop. Consultants, Procurement, Professional Dry docking specifications & Superintendence. Inspections are carried out using relevant IMO codes and guidelines. Aimed to inspect all areas of Dangerous Goods handling and stowage including specialized packaging and transportation. The following are inspected: Draft & Sealing survey Stability calculations Cargo operations monitoring Lashing condition survey Cargo gear inspection and certification Hazardous cargo inspection. Including heavy lift cargo surveys. Undertaken to verify cargo stuffing procedures including quantities, lashing & securing of cargo to minimise damages during loading and transportation operations. For safe hot-works and entry in enclosed spaces, the identification of gases including oxygen content housed are necessary as per regulations. Mainly undertaken for investigation, identification and quantification of damages and/or cleanliness. Identification of any bacteria and damages caused due. Naval architecture, design, inclining/intact/damage stability calc. & manuals, freeboard assignment, modifications, piping designs & major conversions. Drawings, ship board manuals & safety plans. Such certification surveys are conducted in line with international standards / norms to ensure fitness for use. Cargo Oil Hoses Inspection & Cert. Cargo oil hoses are inspected and certified in line with international standards and as per regulations. Includes structural integrity, repair inspection, stuffing, sealing and loading inspection. Inspection and certification of medical lockers according to regulations and supply of medicines when required. Supply & servicing of all kinds of fire & safety equipment, and consultancy. Life saving equipment service & supplies. Sound levels are recorded on board vessels / commercial yachts as required by SOLAS Regulation II-1/3-12. Certificate issued accordingly. Laboratory full analysis of lubrication and fuel. Potential engine problems are likely to be identified before the components actually fail. Ultrasonic Thickness Measurement on steel hulls to determine steel hull thicknesses. Dye Penetration Testing to identify any cracks or porous materials which are not visible to the naked eye. Anywhere in the world at a short notice. Such supervision entails logistics, loading & transportation procedures, towage approvals, inspection of rig integrity, condition & stability & safety certs. We provide pre-vetting inspection and consultancy services on board oil tankers and bunker barges in line with international regulations and OCIMF. Bunker & De-Bunkering Quality & Qty. Undertaken to assure quantity and quality of marine fuel oil and gas oil loaded in-port or off-shore on board ocean going vessels. Oceanus Marine enjoys an excellent track record in the conversion of Aframax size single-hull to double- hull tankers and bunker barges, major & minor modifications of hulls, cargo systems, ballast systems and machinery. Design, construction, commissioning and installation stages are managed by Oceanus Marine personnel and, when necessary with specialised sub-contractors.. The choice for a conversion is often determined by specific project needs. 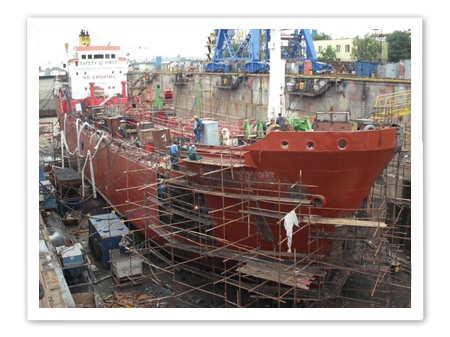 Tanker conversions require various complex structural adjustments to be made to the ship�s hull and structure. Oceanus Marine�s engineers and naval architects perform model tests and finite element calculations to prepare for all structural and naval aspects of a tanker conversion and/or modification..
For each conversion and/or modification project Oceanus Marine develop an operational strategic plan, which meets both the client�s and project�s needs and expectations.